Surely there’s nothing better than the irresistible smell of freshly baked bread? Except perhaps having delicious homemade loaves prepared from scratch, baked ready for you whenever you choose. 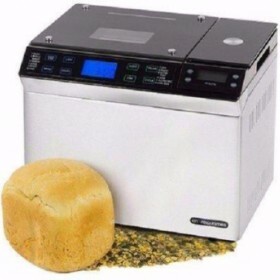 Our fully automatic bread maker has 12 pre-set functions; as well as basic, whole wheat and gluten-free loaves of bread in either 700g or 900g loaves, you can make dough for pizza, cakes and even jam. With light, medium and dark crust settings, it’s easy to adjust recipes according to your taste. 08063810999, Dealer Of All Kind Of Electricals &amp; Electronics And General Merchandise.